MINNEAPOLIS (AP) — After Kirk Cousins underthrew Adam Thielen, one of 10 failures to move the chains out of 11 third-down plays for Minnesota, two of the team's best players engaged in an animated and heated discussion on the sideline as the Vikings frustratingly settled for a field goal right before halftime. A duo that connected on 113 passes for 1,373 yards and nine touchdowns in its first year together was struggling, again, in a late-season game to get in sync. The Vikings never found their rhythm, again, against that daunting Chicago defense. The latest flop by this expensive and decorated offense sealed their fate as a team that didn't make the playoffs, following a 24-10 defeat by the Bears on Sunday. "I love our group of guys, and we weren't ready for it to end," Cousins said, "but unfortunately it's over for this year." The Vikings (8-7-1) punted on their first five possessions, finally getting a first down with six minutes remaining in the first half. They finished with a season-low 164 yards and took four sacks. For the third time in five December games, against playoff-bound New England, Seattle and Chicago, the Vikings had just one touchdown. Cousins, who signed an $84 million, three-year, fully guaranteed contract after leaving Washington as a free agent, finished with a career-high 30 touchdown passes and a career-best 70.1 completion percentage. He passed for 4,298 yards, topping the 4,000-yard mark for a fourth straight season. 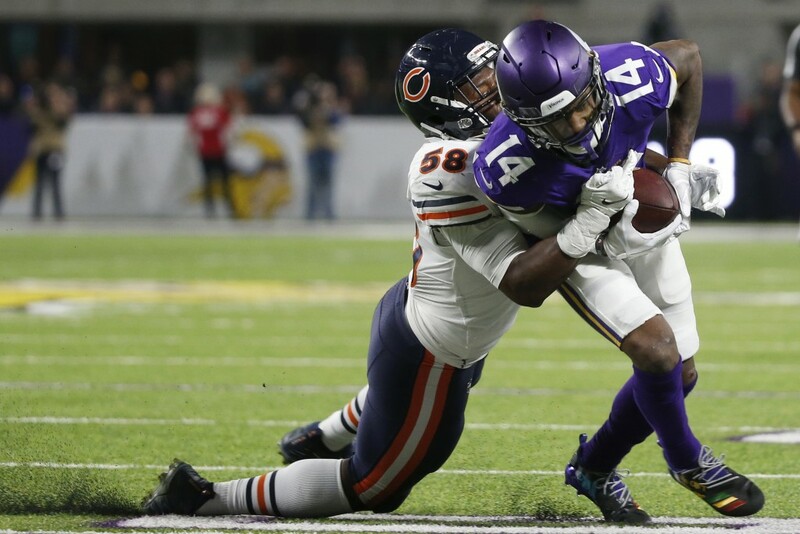 Considering the situation he entered, though, after the Vikings reached the NFC championship game a year ago, the overall assessment of his debut in purple will lean toward disappointment. The only team the Vikings beat this season that made the playoffs was Philadelphia, which ironically leapfrogged them on the last day with a 24-0 win over the Redskins. "I don't have a menu in front of me of all the tough losses," Cousins said. "I'll tell you it's not the first. It won't be the last. It's a part of the journey. You play in this league long enough, you're going to get kicked in the teeth. It's going to happen. Tough times don't last. Tough people do, right? I have a lot of intestinal fortitude." The Vikings didn't exhibit much of that until their drive late in the second quarter, after falling behind 13-0. Cousins went deep down the middle for Thielen on third-and-5, when a facemask penalty by Deon Bush on Thielen during the incompletion gave the Vikings the ball at the Chicago 31. Dalvin Cook dropped a short second-down throw, when Cousins and Cook had a miscommunication about the path of the route and the timing of the pass. Then on third-and-6, Cousins threw toward the sideline. The ball hit the turf at the 6, after Thielen had widened his route behind Kyle Fuller in attempt to reach the front corner of the end zone. A few seconds later, the TV cameras captured Thielen yelling at Cousins on the sideline. Cousins shouted back, "Hey, I don't have 10 seconds!" Then once Thielen was calmer, Cousins was seen acting out how he expected Thielen to adjust his route in order to get open for the ball. "Adam's my guy. He's the best, and I want to have more of those conversations," Cousins said. "I actually liked the passion back and forth." "It definitely wasn't anything with Kirk," Thielen said, "and it actually turned out to be a really good conversation. We talked a lot about what I could have done better and on what we could have done in the second half to exploit their defense." Though Thielen and Diggs became just the seventh pair of teammates to each post 100-plus receptions in the same season, the Vikings finished in the bottom half of the league in far too many statistical categories. "That's something we were trying to find the entire year, what this offense is and how we can be successful," Thielen said. "There were glimpses of it this entire season, but you have to be consistent in this league. Individually I wasn't consistent, and this offense wasn't consistent enough to win."